And yet, there are those who for a variety of reasons refuse to inoculate themselves or their children, or both, even when established governmental authorities require such action. While it is tempting to stereotype all such persons as undereducated or acting out of ignorance, some are not. Aside from the rare situations based on the medical condition of the child, some people object to a particular vaccine or procedure. Others have broader religious, philosophical and personal beliefs that militate against inoculations. (See, e.g., here and here.) Some even may be part of an otherwise socially conscious community. Jewcology is a website that aims to be a resource for the “entire Jewish-environmental community.” One of the blogs that Jewcology hosts is written by Rafael Bratman, and one of Bratman’s posts is entitled “Water Fluoridation and Vaccinations are contrary to Torah principles.” Bratman’s diatribe is filled with so many erroneous statements that one is tempted to let this dog lie and hope that it gets lost in the tangle that is the World Wide Web. The problem, however, is that people visit the Jewcology site and several hundred of them have already indicated that they “like” the anti-vaccination post. While undoubtedly some people get their kicks from clicks, and will “like” anything, one cannot discount the possibility that some readers actually believe the nonsense contained in the piece. Moreover, Jewish tradition teaches that we may not exploit our neighbors by placing a stumbling block in their path, neither may we stand idly by the blood of our neighbor. (See Lev. 19:14, 16.) To the contrary, we are obligated to remove the impediment, to protect the neighbor. So let’s remove this particular stumbling block, piece by piece. Let’s set the record straight. Bratman’s post asserts three main arguments in opposition to vaccinations. The first is that they don’t work, that the benefits are “unclear and unproven.” The second and third relate to Jewish law. Bratman argues that vaccines are treif, that is, they contain ingredients forbidden to observant Jews, and also that their use violates the primary Jewish principle of pikuach nefesh, the preservation of life. None of the arguments is supported by any credible authority. The first is contrary to well established and documented medical science. The second and third thoroughly misstate Jewish tradition, as understood by a broad spectrum of scholars. As explained by the U.S. Centers for Disease Control and Prevention (“CDC”), a vaccine is a chemical compound that contains a “killed or weakened infectious organism” that is then administered to a human being in order to prevent a disease. The diseases for which vaccines are administered include measles, mumps, pertussis (whooping cough), hepatitis, and smallpox, among more than a dozen. If you are not familiar with one or more of these diseases, thank a vaccination program. According to the National Institute of Allergy and Infectious Diseases, a part of the U.S. National Institute of Health, vaccines work because they stimulate the human immune system to attack the invading microbes present in the vaccine. That is, they simulate a disease and trick the body into fighting it resulting in immunity to the real disease. When introduced into a community, vaccination programs have been extraordinarily successful in preventing cases of disease and related consequences. The long view is instructive. In 1900, 53% of the causes of death in the United States were infectious diseases. 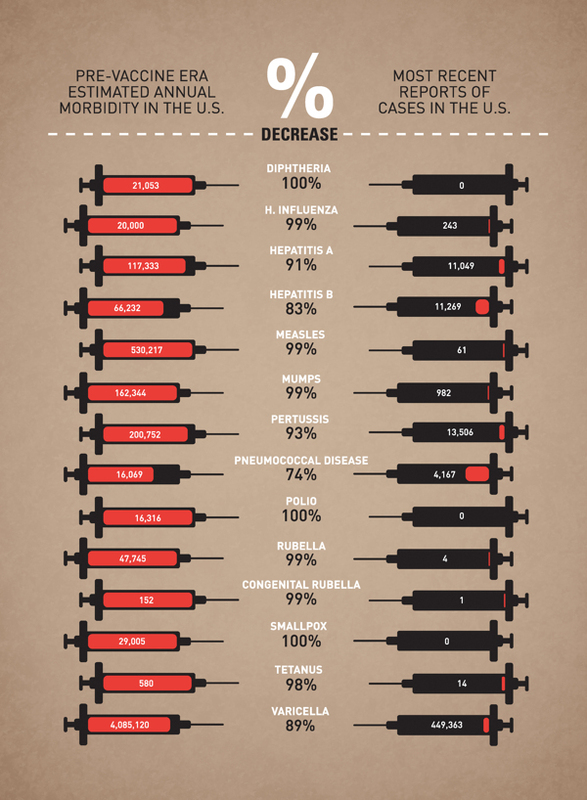 By 2010, as a result of various vaccination programs, infectious diseases were responsible for only 3% of deaths in the United States. Over and over, the demonstrated facts are that vaccines work. Moreover, if enough people in a particular community are vaccinated, a process known as community or herd immunity develops offering protection to the few who, due to special circumstance, cannot be vaccinated. Conversely, where participation in a vaccination programs has declined or been refused, we have seen a resurgence of diseases like measles, mumps and whooping cough, that some thought were contained if not eradicated. These outbreaks typically occur in close communities whose members fail to act vigilantly to secure comprehensive compliance with vaccination programs. In 2013, for instance, measles outbreaks were reported in a faith healing megachurch in Texas and the Orthodox Jewish neighborhoods of Williamsburg and Borough Park in Brooklyn, New York. A few years earlier, there was a mumps outbreak in New York and New Jersey. An investigation found that 97% of the case patients were Orthodox Jews. Even more recently, measles has spread to upper Manhattan and the Bronx and has been reported in other areas around Boston, San Francisco and Los Angeles. What the CDC has found is that more than 80% of the reported cases occurred in persons who were not vaccinated and about four of every five such individuals purposefully chose not to be vaccinated! Referring to certain ingredients found in vaccines, Bratman asserts that for anyone who takes kashrut seriously, “it would seem a no brainer to avoid vaccinations.” On analysis, however, this argument fares no better than his first claim. Vaccines, like other medical preparations, contain a variety of ingredients for a variety of purposes. Some of these ingredients are the active components in the vaccine, necessary for it to perform its task. Others are used as stabilizers for live vaccines or as preservatives. 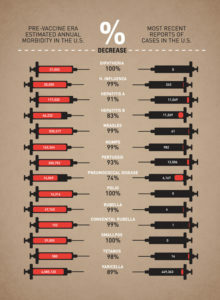 For vaccines available in the United States, the CDC provides a comprehensive list of ingredients contained in those vaccines, as well as ingredients used in the manufacturing process but removed or remaining only in trace amounts. There is no doubt that some formulations of certain vaccines contain products that, if consumed, would possibly or certainly be considered treif by most authorities. These include not only chick embryo cell cultures and bovine muscle tissue, but such items as Vero (monkey kidney) cells, Madin Darby Canine Kidney (MDCK) cell protein, hydrolyzed porcine gelatin, embryonic guinea pig cell cultures, and human diploid cells such as lung fibroblasts. For many, whether those items are more or less appetizing than other ingredients like formaldehyde, thimerosal, hexadecyltrimethylammonium bromide and sodium taurodeoxycholate is a matter of, well, taste. But the question here is whether they are treif when received by way of inoculation or spray or some other non-oral application. Israeli Orthodox Torah scholar Rabbi David Samson summarizes the legal situation as follows: “There is no prohibition in using medicines which contain forbidden ingredients if they are administered by injection, suppository, enema, medicated bandage, and the like, since they are not eaten.” Bratman seems to have missed that distinction. Rather than simply conclude that the issue is a “no-brainer” after all, let’s just say that some folks with very fine Jewish brains, who actually took the time to study the tradition and apply it to scientifically established facts, uniformly have agreed that the original source or nature of certain ingredients does not render non-oral applications of vaccines as treif. Bratman’s final argument is that vaccinations violate the Torah principle of pikuach nefesh. His contention could not be more wrong. 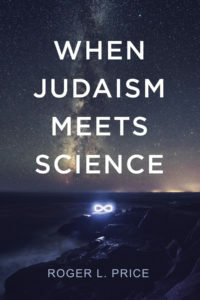 Obviously, there was nothing that we would recognize as resembling medical science in the days of the authors of the Torah or those of the Sages whose interpretations of Torah were collected in the Mishna and the Talmud. The rudimentary understandings of the great twelfth century physician scholar Moses Maimonides (aka Rambam) did not encompass vaccinations, either. Nevertheless, far from condemning vaccinations, the Jewish tradition contains principles that are both well established and almost universally understood to be applicable today and support vaccinations against infectious diseases. Subsequently, rabbis interpreted Moses statements as God’s commandments to protect one’s health, to guard against disease. The Talmudic concern with the well-being of a child was broad and deep. For instance, a parent was obligated to teach his child how to swim, lest the child be in danger if he was traveling by boat and the boat began to sink. (See BT Kiddushin 29a.) The overarching concern was the child’s needs. The rabbis’ teachings were not merely academic, as became clear not long after Edward Jenner introduced the first effective vaccine against smallpox in England in 1796. In Eastern Europe, the Chassidic master Rabbi Nachman of Bratslov, wrote in his Kuntres Hanhagot Yesharot, that one “must be very careful about the health of children . . . (and) inoculate every baby against smallpox before the age of three months, for if he does not do so, he is like one who sheds blood.” (See here (14/31).) Sadly, in 1810, Rabbi Nachman died at age 38 of tuberculosis, a century and a half before the development of a TB vaccine. The Conservative Movement’s view was expressed six years later by the Rabbinical Assembly’s Committee on Jewish Law and Standards, also with respect to school immunizations. The Committee’s statement “Compulsory Immunization in Jewish Day Schools” (the “Statement”) was authored by Rabbi Joseph Prouser. It begins with a review of state immunization mandates and various objections to vaccinations. In its review of Jewish law, not surprisingly, it places a greater emphasis on a larger number and wider variety of traditional sources than did the CCAR. The results were, however, the same. Needless to say, Bratman does not discuss numerous pertinent passages in the Torah and Talmud, the various codes of Jewish Law, or contemporary commentary from Orthodox, Conservative, Reform and Reconstructionist perspectives, each of which leads to or reaches the same conclusions. Vaccinations are not contrary to Torah principles. Indeed, vaccinations are mandated because Jewish tradition places the highest value on preventing foreseeable damage to individuals and the community. There are not more than fourteen million Jews on this planet. And we cannot afford to lose a single one to a preventable disease. As Rabbi Prouser reminds us, in prior times, in places where Jewish law governed, those who endangered the health and well being of the community could be lashed or excommunicated. (See Statement, at 22-25/31.) In America today, lashing and excommunication are not likely, or even desirable, remedies to achieve compliance with Jewish norms. But we can still speak, and still insist: For the sake of the children and in the interest of the Jewish People, Mr. Bratman, take down that post! This entry was posted on Thursday, June 19th, 2014 at 9:56 pm	and is filed under Bible, Health, Life Sciences. You can follow any responses to this entry through the RSS 2.0 feed. You can leave a response, or trackback from your own site. There is a famous Jewish folktale about a village that was to share in a celebration and each family was asked to bring some wine and pour it in a communal vat for sharing. When the offerings were completed and they gathered to toast the event they discovered that there was only water in that vat. When questioned they all admitted to bringing water as they assumed the others would bring the wine. We can’t assume for the safety of our family and friends that they will do the right thing and therefore we will be protected. Decades of studies published in the world’s leading medical journals have documented vaccine failure and serious adverse vaccine events, including death. Dozens of books written by doctors, researchers, and independent investigators reveal serious flaws in immunization theory and practice. Yet, incredibly, most pediatricians and parents are unaware of these findings. This has begun to change in recent years, however, as a growing number of parents and healthcare providers around the world are becoming aware of the problems and questioning mass mandatory immunization. I thought we were not allowed to even touch a pig, what are your thoughts? While the Torah expressly forbids touching the carcass of a pig (Lev 11:7–8), that prohibition was modified by later authorities like Rashi so as to be applicable only to Jews traveling to Jerusalem for the traditional pilgrimage festivals. In any event, rabbis across the Jewish spectrum today agree that getting a shot with a vaccine which includes pork cells is not at all the same as touching a pig’s carcass. Far from being forbidden, such a vaccination is required in order to protect an individual and a community from debilitating, even deadly, disease. Similarly, the use of pigskin and pig heart valves is acceptable as part of transplant surgery to save a life. Certain vaccines may contain blood cells or products derived from blood cells. For instance, according to the FDA, chicken pox, MMR, and rabies vaccines may contain human albumin derived from human blood. So what? The vaccines are not eaten, they are injected and, therefore, there is no violation of kashrut any more than there would be if the vaccines contained pork cells. Similarly, while there always may be an outlying opinion somewhere, Jews are not prohibited from receiving blood transfusions when medically appropriate. If liters of blood may be injected, surely a very small number of cells in a vaccine may be.